The monastery of Geghard (Armenian: Գեղարդ, meaning spear) is a unique architectural construction in the Kotayk province of Armenia, being partially carved out of the adjacent mountain, surrounded by cliffs. It is listed as a UNESCO World Heritage Site. The complex of medieval buildings is set into a landscape of great natural beauty, surrounded by towering cliffs at the entrance to the Azat Valley. The monastery complex was founded in the 4th century by Gregory the Illuminator at the site of a sacred pagan spring inside a cave, holding one of Armenia’s purest water-springs. The monastery of Geghard contains a number of cave churches and tombs, most of them cut into rock, which illustrate the very peak of Armenian medieval architecture. It is called “the Monastery of the Spear”, because of the spear which had wounded Jesus at the Crucifixion, allegedly brought to Geghard by Apostle Thaddeus, and stored among many other relics. 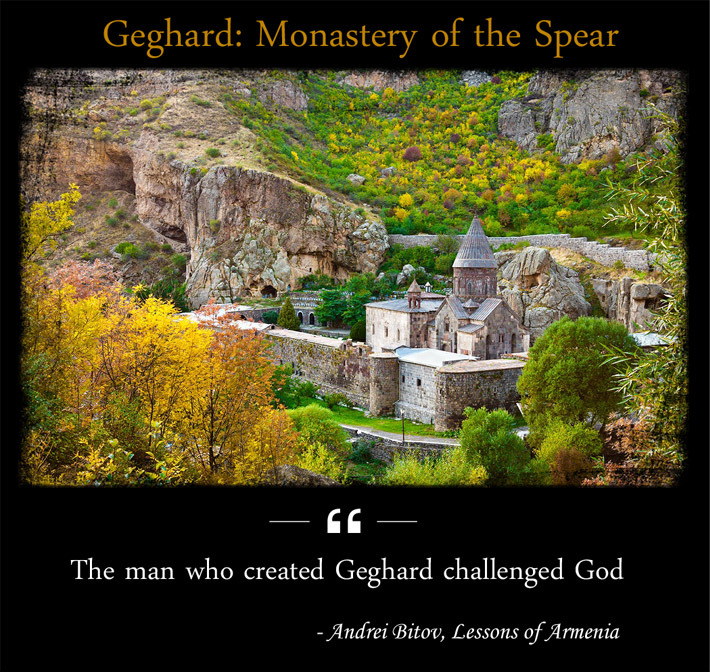 For more beautiful pictures of Geghard click HERE!